Catch You in Game Seven: The Canucks and Blues have met only twice before in the playoffs. Both series went the limit, with Vancouver prevailing each time. The Canucks won a seventh game in the Western Conference Quarterfinals in 1995. They repeated the trick, this time at home, in pulling out the 2003 Western Quarterfinal series. You Call That a Stretch Drive? Losers of eight straight in January, the Canucks rallied to go 23-7-2 over their final 32 games. The Blues have an even more amazing story: Last in the 15-team Western Conference in late February, they posted a League-best 25-9-7 second-half record to make the playoffs for the first time in five years. Fortresses in the Crease: Ever since the June 23, 2006, trade that brought him to Vancouver, Roberto Luongo’s status as the Canucks’ No. 1 goaltender has been unquestioned. For St.Louis, veteran Chris Mason, whom the Blues acquired from Nashville for a fourth-round draft pick last June, started the final 33 games and went 24-8-6 over his last 38. Rocky Mountain High: Both clubs closed their regular seasons with 1-0 victories in Denver. Vancouver’s shutout of the Avalanche Saturday clinched the Northwest Division title. St. Louis’ triumph in the Pepsi Center Sunday evening enabled the Blues to go from eighth to sixth in the final Western Conference standings. St. Louis Specialties: The Blues ranked seventh on the power play and third on the penalty kill this season. In contrast, Vancouver ranked 17th on the power play and 16th on the penalty kill. Identical Twins: Brothers Daniel and Henrik Sedin each recorded 82 points this season to lead the Canucks. Daniel was plus-24 with seven game-winning goals. Henrik was plus-22 with eight game-winners. St. Louis can counter with their disparate killer Bs: Brad Boyes, the 26-year-old RW who scored 16 of his team-leading 33 goals on the power play, and David Backes, the 24-year-old RW who had 165 penalty minutes to go with his 31 goals. Oct. 6: Acquired D Shane O’Brien and RW Michel Ouellet from Tampa Bay for D Lukas Krajicek and LW Juraj Simek. Dec. 18: Signed free agent C Mats Sundin. Dec. 30: Acquired G Jason LaBarbera from Los Angeles for Vancouver’s 7th-round pick in the 2009 Entry Draft. Feb. 27: Claimed D Ossi Vaananen on waivers from Philadelphia. The Canucks were among the NHL's hottest clubs over the second half of the season, posting a 23-7-2 record after Feb. 1. They set a franchise record with 11 consecutive home wins from Feb. 3 to Mar. 19 and have suffered only one regulation loss at home since Jan. 30th (13-1-2). Twins Daniel and Henrik Sedin finished 1-2 in team scoring for the third consecutive season in 2008-09, each tallying 82 points (Daniel 31-51--82, Henrik 22-60--82). Henrik ranked eighth in the League in assists. In March they both surpassed the previous franchise high for points in a calendar month, combining for 37; Henrik recorded 7-12--19, Daniel had 5-13--18. The Canucks are 178-58-25 when each Sedin records a point. C Mats Sundin signed with the Canucks on Dec. 18. He made his debut with the club Jan. 7 and went on to record 28 points (nine goals, 19 assists) in 41 games. Sundin ranks among the NHL's top 25 all-time in goals (T-20th, 564) and points (25th, 1,349). G Roberto Luongo missed eight weeks (from mid-November to mid-January) with a groin injury but still managed to collect 33 wins and nine shutouts, the latter ranking second in the League. The Canucks captain set a career shutout sequence mark by going 242:36 without allowing a goal from Nov. 2-12. The streak was the League's longest since Brian Boucher set the modern NHL record (332:01) in the 2003-04 season. This year will mark Luongo's second career playoff appearance. On Apr. 11, 2007 he made among the most spectacular post-season debuts in NHL history by stopping 72 of an NHL-record 76 shots in a 5-4 win over Dallas that was decided in the fourth overtime period. That night, Luongo faced the most shots in an NHL game since the League started recording the statistic in 1956. He ended the 2007 playoffs with a 1.77 goals-against average and .941 save percentage in 12 games. D Mattias Ohlund set the franchise career scoring record for defensemen Mar. 15 against Colorado with his 322nd point, passing Jyrki Lumme. 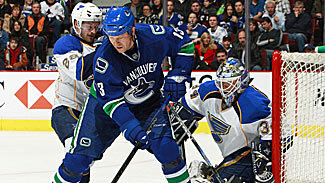 Ohlund has played his entire 11-year NHL career in Vancouver and is the second-longest tenured blueliner in franchise history with 770 appearances, trailing Harold Snepsts (781). LW Alex Burrows' high-energy game has made him a fan favorite at GM Place. Playing alongside the Sedins on Vancouver's top line, Burrows scored 15 goals in a 21-game stretch from Feb. 19 to Apr. 4. He also was a threat on the penalty kill with four shorthanded goals, tied for fourth in the League. Oct. 31: In a highly unusual way for Vancouver goaltender Roberto Luongo to celebrate his 500th career game, the Canucks outscored the Anaheim Ducks, 7-6, in a game that was decided in the 13th shootout round. The Canucks led, 5-2 and 6-5, before Anaheim's Corey Perry scored a goal for his fifth point of the game to tie the score with less than a minute to play in regulation. Luongo stopped 12 of 13 shootout attempts to post the win. Feb. 3: The Canucks ended an eight-game winless streak (0-5-3) and nine-game skid on home ice (0-6-3) with a 4-3 victory over the Carolina Hurricanes. Canucks forward Alex Burrows scored the winning goal on a shorthanded breakaway with 1:22 remaining to end the Canucks' slide. Goaltender Roberto Luongo posted his first win in six tries since returning from a groin injury. The win marked the start of a franchise-record 11-game home winning streak. Feb. 17: The Canucks earned a dramatic late win against division rival Calgary, defeating the Flames, 4-3, in a shootout at Pengrowth Saddledome. Vancouver defenseman Kevin Bieksa tied the game at 19:09 of the third period with goaltender Roberto Luongo on the bench for an extra attacker and Pavol Demitra tallied the only shootout goal for the win. Luongo and Calgary's Miikka Kiprusoff combined for 78 saves. Jan. 7: Signed as a free agent in late December, center Mats Sundin made his long-anticipated Canucks debut in a 4-2 victory at Vancouver. Sundin, playing his first game in nine months, did not record a point or shot in 15 minutes of ice time but the Canucks were sparked by two goals in 12 seconds from Steve Bernier late the second period. Feb. 21: In an ending suitable for a Hollywood script, Mats Sundin scored the game-winning shootout goal in an emotional homecoming to Toronto, where over 13 seasons he had forged one of the greatest careers in Maple Leafs history. After being selected First Star in the Canucks' 3-2 victory, Sundin returned to the ice amid a thunderous ovation from the fans at Air Canada Centre. Nov. 18: Claimed B.J. Crombeen on waivers from Dallas. Nov. 24: Acquired D Carlo Colaiacovo and C Alex Steen from Toronto for RW Lee Stempniak. The Blues engineered one of the greatest comebacks in NHL history, posting the League's best record second-half record (25-9-7) and jumping from 15th place in the Western Conference standings to the #6 seed for their first playoff appearance since 2003-04. What's more, they made their epic run without a trio of core players -- defensemen Eric Brewer and Erik Johnson and LW Paul Kariya, all sidelined with long-term injuries. The Blues handed the goaltending reins to Chris Mason after assigning veteran starter Manny Legace to AHL Peoria Feb. 7. Mason started the Blues' last 33 games of the season and was 24-8-6 over his final 38 decisions with a 2.08 goals-against average, .924 save percentage and five shutouts from Jan. 19 through the end of the season. Mason led NHL goaltenders in wins and GAA over that span. Mason’s five shutouts tied him with Evgeni Nabokov of San Jose and Cam Ward of Carolina for the NHL high during that stretch. RW Brad Boyes was the Blues' most consistent offensive contributor in 2008-09, leading the team in goals (33), assists (39), points (72), power-play goals (16), game-winning goals (11) and shots (220). His game-winning goal total was second in the NHL behind NHL leader Jeff Carter of Philadelphia (12). C Keith Tkachuk reached the 20-goal mark for the 15th time in his NHL career, ranking fourth on the Blues in scoring with 49 points (25 goals, 24 assists) in 79 games. The Melrose, Mass. native reached the 1,000-point milestone Nov. 30 at Atlanta, becoming the seventh U.S.-born player to accomplish the feat after Mike Modano (Livonia, Mich.), Phil Housley (St. Paul, Minn.), Jeremy Roenick (Boston, Mass. ), Joe Mullen (New York, N.Y.), Brian Leetch (Corpus Christi, Tex.) and Pat LaFontaine (St. Louis, Mo.). The Blues retained the services of C David Backes by matching an offer sheet from Vancouver for the second-year player during the off-season and Backes went to post career-best totals in 2008-09. Backes ranked second on the Blues with 31 goals, two behind leader Brad Boyes. He also ranked second in points with 54, matching his career total from 121 NHL games entering the season. C T.J. Oshie showed during the Blues' second-half surge why he entered the 2008-09 season as one of the NHL’s highest-touted rookie prospects. From Dec. 30, when Oshie returned from an extended absence due to injury, until the end of the season, he ranked second among NHL rookies in scoring with 35 points (12-23--35) in 45 games. The Mt. Vernon, Wash., native was the Blues’ first selection, 24th overall, in the 2005 Entry Draft and spent the previous three seasons at the University of North Dakota, leading the Fighting Sioux to three consecutive NCAA Frozen Four appearances. The Blues' playoff-clinching victory Apr. 10 against Columbus also was their 100th win under head coach Andy Murray (100-85-32). Murray became the sixth Blues coach to reach the milestone. Murray won his 300th NHL game overall on Feb. 19 at Nashville and sports an overall record of 316-261-121 in 698 games. Oct. 13: Blues fans gave thanks for the two points the club collected in a 5-4 comeback victory at Toronto in a matinee at Air Canada Centre. The Blues trailed, 3-0, after the first period, rallied to tie the score, 3-3, in the second period and evened the game, 4-4, in the third. Center Andy McDonald and former Maple Leafs first-round draft pick Brad Boyes tallied in the shootout to give the Blues a crucial win. Jan. 19: The Blues captured a dramatic 5-4 shootout victory over the Boston Bruins in one of the wildest finishes of the 2008-09 season and a game that many identify as the turning point in the Blues' comeback season. Boston scored three times within 1:39 late in the third period to a take a 4-2 lead, but the Blues responded with goals by David Perron at 18:40 and David Backes with eight tenths of a second remaining in regulation time. After a scoreless overtime, the Blues secured the win with shootout goals from T.J. Oshie and Brad Boyes. The Blues entered the game with the worst record in the Western Conference and had lost nine of their previous 10 road games. Mar. 26: Prized Blues' rookie T.J. Oshie electrified the crowd at Scottrade Center with a highlight-reel goal, sparking St. Louis to a 4-2 victory over the Vancouver Canucks. Oshie, whose flu-like symptoms kept him home from the morning skate, stickhandled his way past multiple defenders and beat Vancouver goaltender Roberto Luongo to tie the game, 1-1, early in the second period. Three minutes later, he set up David Backes' shorthanded goal that put the Blues ahead to stay. Oshie garnered First Star honors in the win, St. Louis' eighth in 11 games. Apr. 2: Blues center David Backes turned in one of the top single-game performances by an NHL player this season, notching four goals, a +2 rating and a game-high nine shots in a 5-4 victory at Detroit. Backes tallied the game's first two goals in the second period, gave the Blues a 3-2 lead early in the third and scored the game-winner with just over four minutes left in regulation. The win lifted the Blues into the Western Conference's top eight for the first time, the culmination of an epic climb from 15th place. Apr. 10: The Blues completed a stirring second-half comeback by clinching their first playoff berth since 2003-04 with a 3-1 victory over the Columbus Blue Jackets in front of a raucous sellout crowd at Scotttrade Center. Center Keith Tkachuk scored twice for the first time since the opening night of the season and goaltender Chris Mason turned aside 16 of 17 shots in his 32nd consecutive start.